Happy Saints: Celebrate Divine Mercy Sunday with the Happy Saints Favorite Prayers eBook! Celebrate Divine Mercy Sunday with the Happy Saints Favorite Prayers eBook! This Sunday is Divine Mercy Sunday! How are you planning to celebrate this great Feast with your family, school or parish? 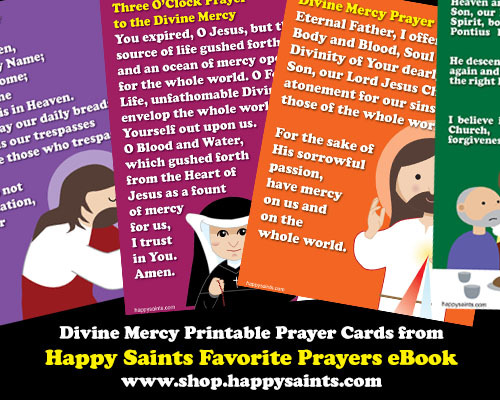 The Happy Saints Favorite Prayers eBook includes the Divine Mercy Prayer and the 3 O’Clock Prayer that you can print in posters, prayer cards, badges and coloring pages!